I wrapped up 2012 with a few posts on some photos I’d taken through the year related to swimming. About the time I writing those posts, I embarked on what is known as a 365 Project, taking a photograph (often many more) every day for a year, which I completed this week. (I started it thanks to Sandycove swimmer Riana Parsons and those 365 photographs can be seen on my Blipfoto account. Portraiture is a difficult aspect of photography for some, including me, as it requires either a willingness to demand co-operation from subjects or a constant almost covert imposition of a camera. I’m not comfortable with either, but I have been learning to pursue the form. The number of portrait photographs from the year is still low and time goes by when I completely forget to take any. So here are a few of my preferred shots of swimming people from the year. Once again, i chose mainly based on photographic merit rather than any personal relationships, but the range illustrates, I think, what attracts us about this sport, the people we met, the friends we make. My swimming Dad: David Frantzeskou, along with Evelyn, the owner of Varne Ridge Caravan Park outside Dover, one of my favourite places and amongst my favourite people, with so many different and enduring memories. It took some convincing of both David & Evelyn that this was a shot that I was proud of, displaying that slightly perplexed look we know so well on David’s face. I was fortunate to be part of another World Record English Channel swim crew for the second year in a row, this time with my friend Sylvain Estadieu. 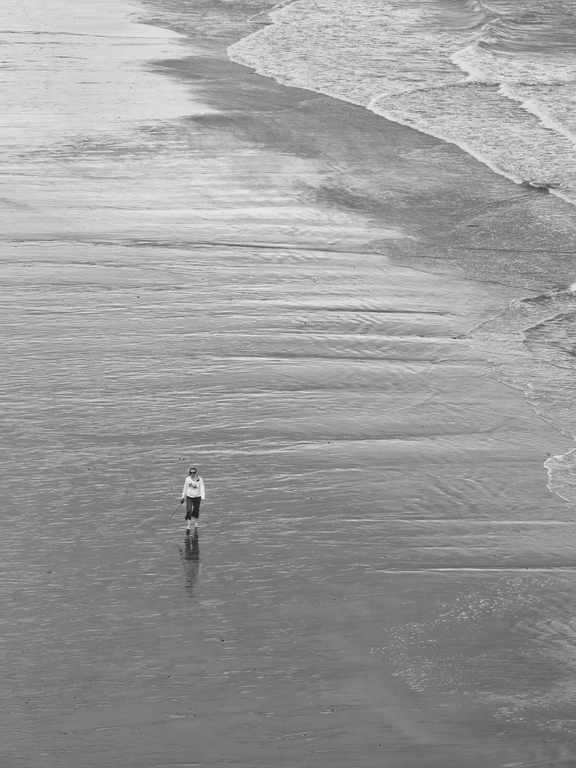 While images of Sylvain butterflying away from the White Cliffs or standing triumphant with the French tricoloeur are popular, this one is my favourite, the moments before the swim, a glimpse into Sylvain. 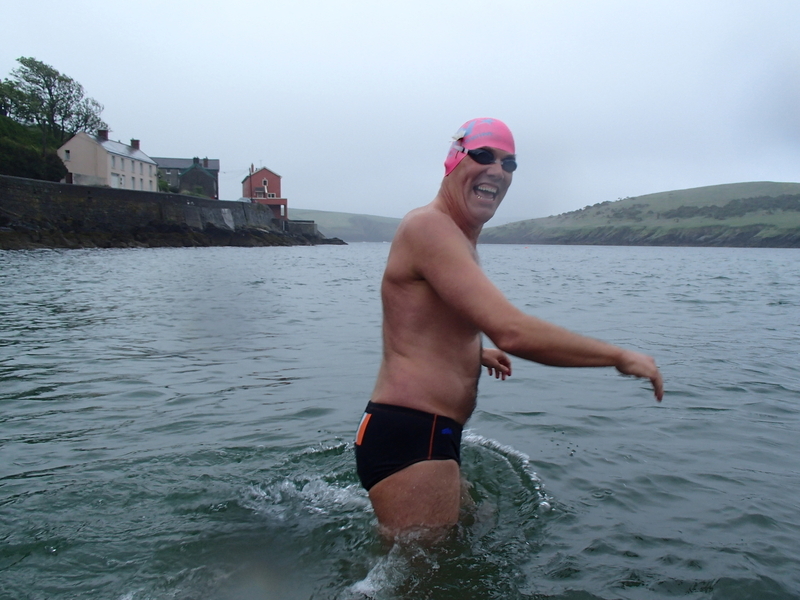 On a grey day in summer we took to a few laps of Sandycove to wish our 2013 Manhattan Island Sandycove swimmers, Liam, Carol & Lisa the best. One of my shortlived waterproof cameras from this year (three!) caught a typical Liam Maher pose, English channel swimmer in front of Sandycove’s famous Red House (now beige). The Red House is used to mark final 400 metre sprints, the best line for the slipway and for the marathon swimmers of the club, could be seen from about two kilometres out for those who have braved the Speckled Door to Sandycove swim. The laugh on Liam’s face is entirely typical. After the Global Swim Conference visitors had all left the island, there were a few local Sandycovers hanging around chatting. Probably eating cake. 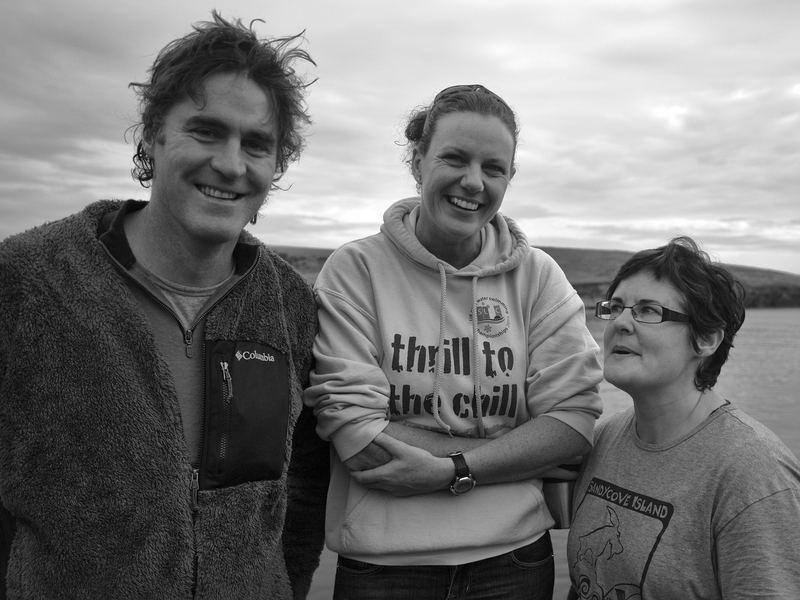 Left is Eoin O’Riordan, middle is Carol Cashell and right is Maeve Moran. 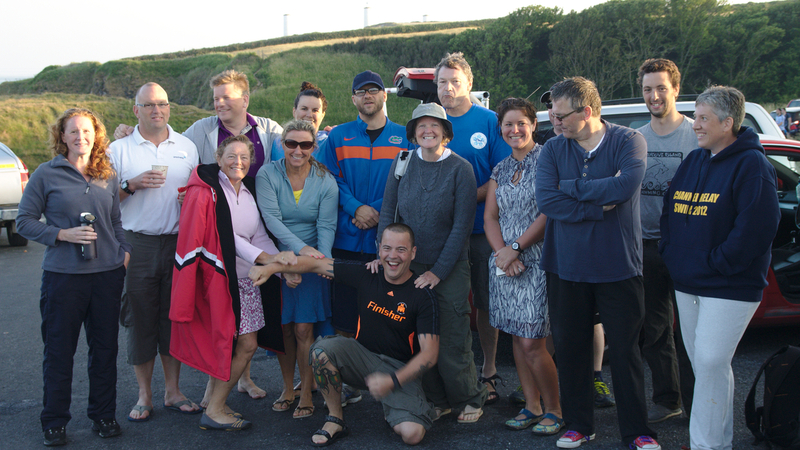 Eoin joined Carol in an English Channel two-way relay team as a substitute and did some great training, and the team went on to set a new two-way six person national English Channel record, after Carol had returned from getting second placed lady in the Manhattan Island Marathon swim. 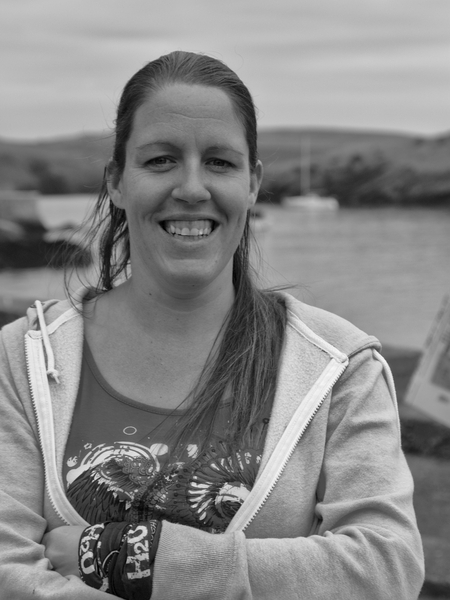 Maeve is another Sandycove regular and perennial and invaluable volunteer who will be swimming an English Channel relay next year. 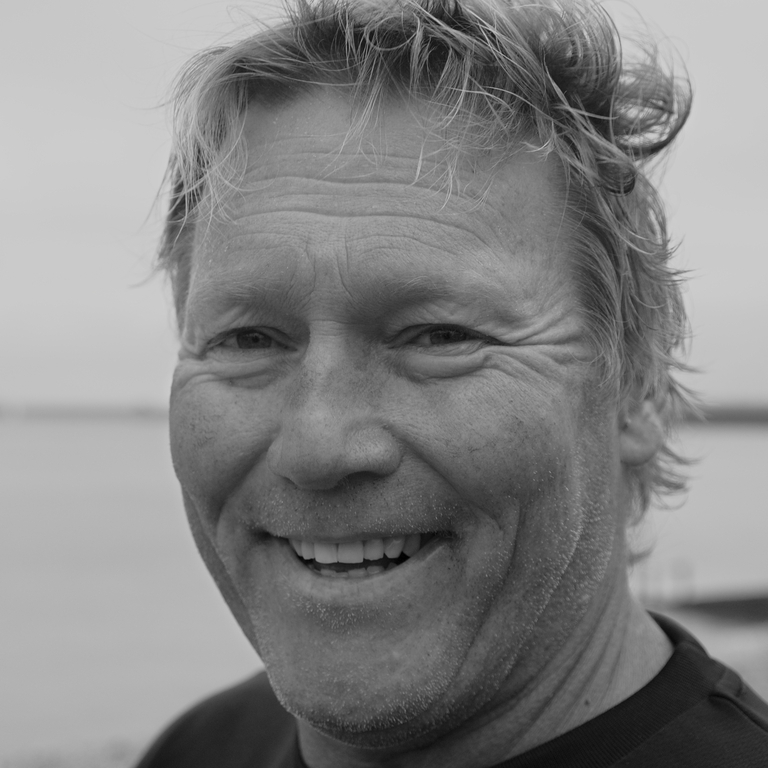 Nick Adams, President of the CS&PF and multiple English Channel soloist and other swims, celebrates being inducted into the International Marathon Swimming Hall of Fame as the Global Open Water Conference in Cork. With him is English Channel solo and many other swims, Dr. Sakura Hingley. 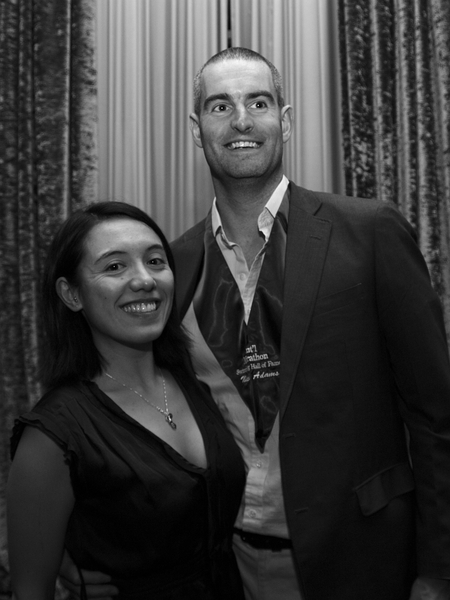 Nick and Sakura had been married only recently, on August 25th, the anniversary of Captain Matthew Webb’s first English Channel solo. Both have been promising me articles for this blog for over two years. I am starting to lose hope. My very good friend Lisa Cummins, now living down-under and getting a free summer, well-known to all as one of the legendary two-way English channel swimmers. 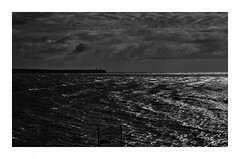 Lisa and I were once again on a few adventures this year, and therefore she had to put up with many attempts at portrait shots by me before I finally found one I was pleased with, in Sandycove of course. Ray is a member of the Newtown and Guillamenes swimming club, my other (non-racing) club. 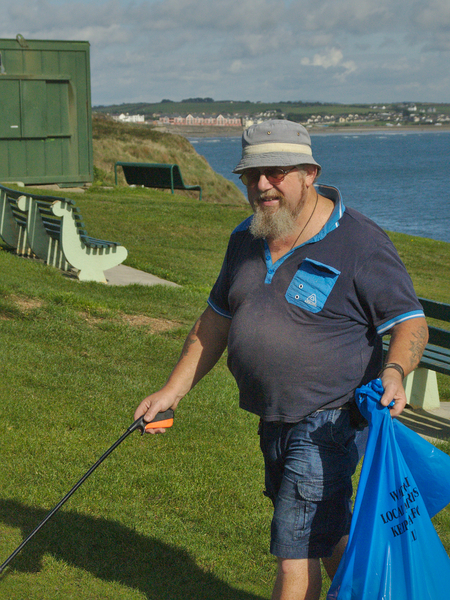 Every day of the summer, from May until the end of September, Ray empties the bins, picks up rubbish and litter, keeps the coves and lawns of Newtown and Guillamenes pristine, and even cleans the public toilets for the tourists, after the town council refused to so do. Ray is one the quiet heroic volunteers without whom no club in the world could survive and I have enormous respect for him. 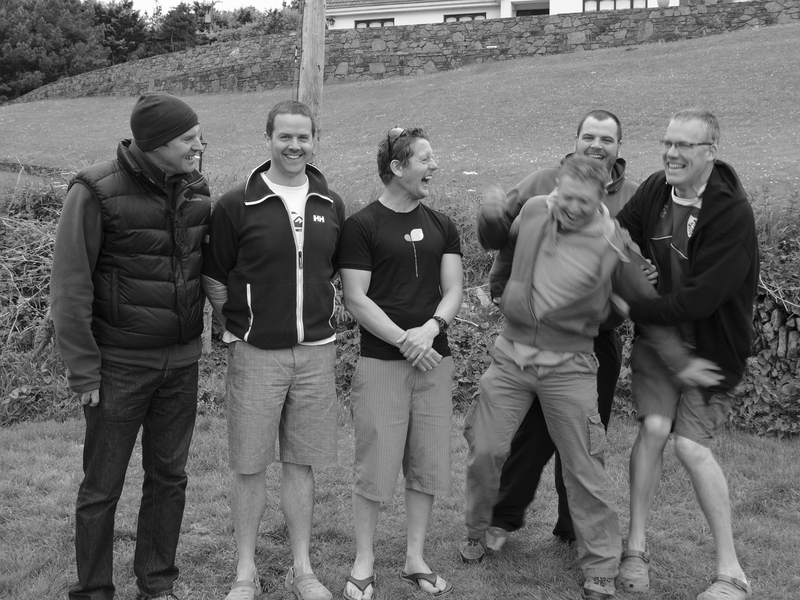 Left to right, Ciáran Byrne, Eddie Irwin, Craig Morrison, , me being manhandled, Finbarr Hedderman in back and Liam Maher, after a spring swim in Sandycove. Channel Soloists all. I didn’t take this shot, but handed the camera to Maura (Hynzie) Morrison. When you are being manhandled by Finbarr (6’4″) & Liam (6’8″) it’s like being caught in a landslide, there’s no fighting it. It’s good to have such friends. 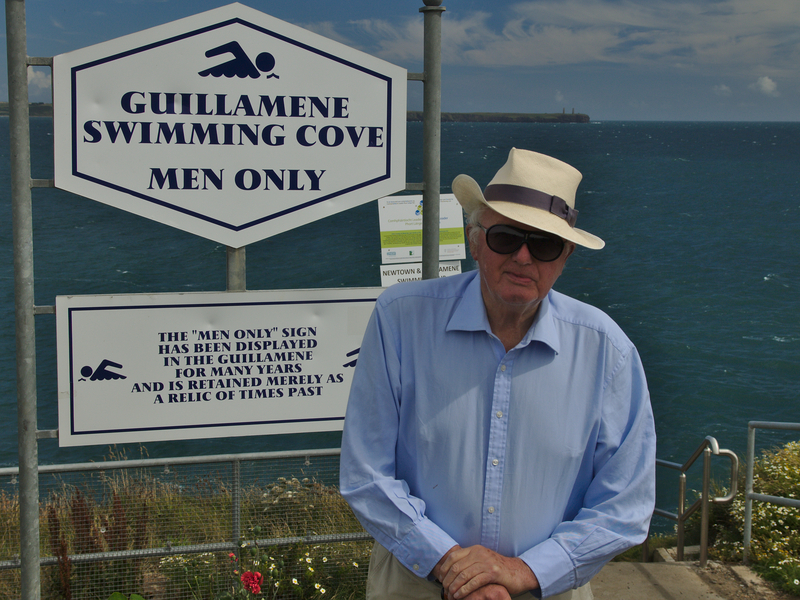 Billy Kehoe, President of the Newtown and Guillamenes swimming club, 85 years old, and swimming at the Guillamenes for 75 years. I don’t think a single occasion has passed over the years that Billy hasn’t used the same joke with me, that I am not to swim past the Saltees (Islands), despite my offering to write him some new material. Billy is currently working on a history of the Newtown and Guillamenes swimming club that hopefully is almost near completion and to which I am really looking forward and will hopefuly publish her and on the club website, which I have completely neglected . 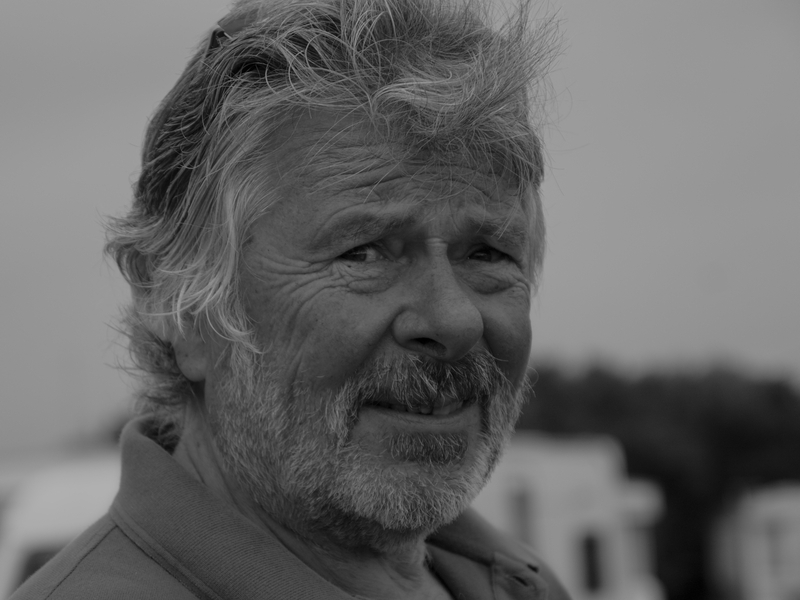 Channel Swimming & Piloting Federation pilot and gentleman, Paul Foreman. 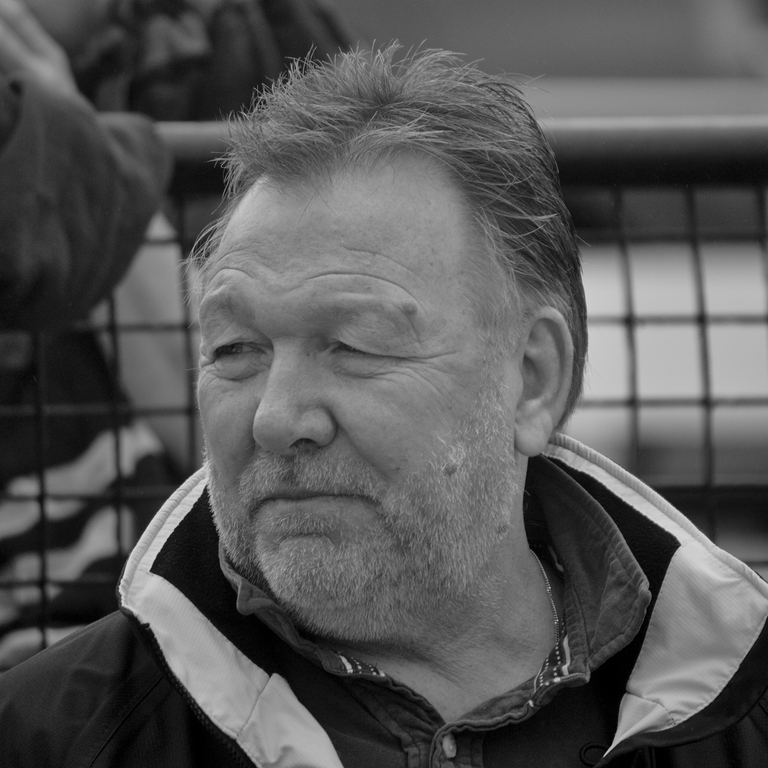 Formerly of Pace Arrow, now of the Channel fleet’s best boat, Optimist, pilot for Gábor Molnar and Jen Hurley and our tragically lost friend Páraic Casey, Paul holds a special place of affection for many Sandycove swimmers who know him and were friends of Páraic. If you were to come up with any list of the ten most important people in the history of Channel swimming, Freda Streeter would be on that list. 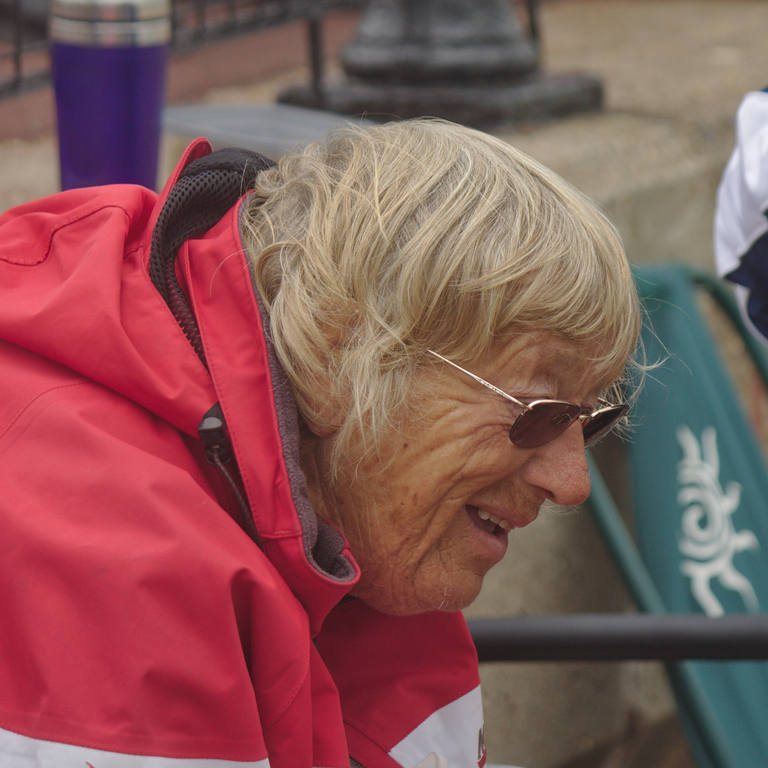 Mother of Alison, the Queen of the Channel and CS&PF Channel pilot Neil, Freda has trained hundreds of Channel swimmers and was instrumental in the formation of the CS&PF. For thirty years every weekend from May until September, with Barrie and Irene Wakeham and many others who assist, Freda runs a free Channel training camp for all comers. I finally met cheeky chappie and South African Channel soloist Roger Finch in Varne Ridge, where all Channel swimmers eventually meet and then one day on Dover beach. He was training with Otto Thaining, whom I briefly met later. Otto was training to be the oldest Channel Soloist. Roger and I knew many people in common. Unfortunately Otto got weathered out, but my money is on him both returning and being successful next year. With the ebullient Roger in his crew he’s all set. My young friend Owen, the Fermoy Fish and I voyaged together again this year, most notably on his pioneering Blackwater swim. 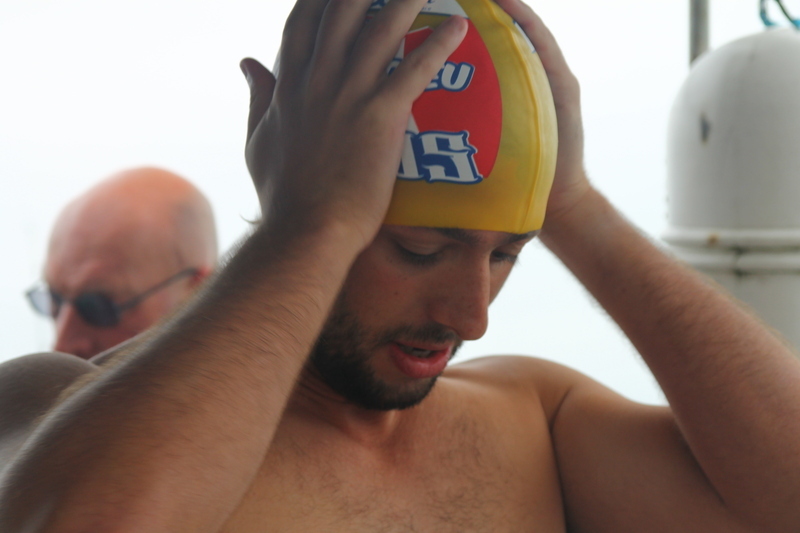 After Trent Grimsey’s swim last year, I’d come to the conclusion I may have taken my best ever photo of a swimmer. I guess my development as a photographer now leads to me realise that was a laughable conceit. Reviewing my pics of the year, I’m currently of the belief this is the current best photo of a swimmer I’ve taken, getting past the stroke, the conditions, and inside Owen, as close metaphorically as I can get into another swimmer’s mind. During Sandycove Distance Week, about 20 of the less lazy of the swimmers came over for a swim with me on the Copper Coast. It was one of the best days of the bet summer in a generation. There were complaints about the water being too warm! granted, this photo wasn’t chosen for its photographic merit, but for the sheer pleasure I derived from so many visitors. Constrained as I am from publishing a photo of her, here’s my silent partner in most adventures and supporter in others. I look to meeting you all and capturing your images in 2014. 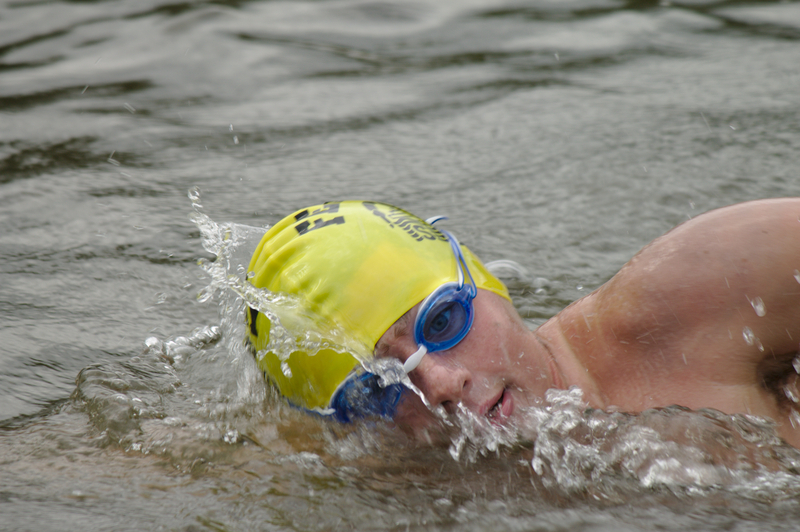 Great photos…a lady turned up at squad this morning and the guys said she was a double channel swimmer in Sydney for a few months…not sure if it was Lisa on not. She was in our team for the last-squad-of-the-year high jinks and we won…so she’s the business alright. Not Lisa so, she’s on the other side of the country so. The most obvious candidate is Chloe McCardel but I imagine you’d know of her?